The Four Villages Community Health Centre is a non-profit, primary health care facility. Since 1991, we have been providing many needed services to the individuals and families living in our service area. 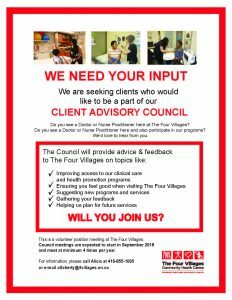 The Four Villages Community Health Centre provides primary health care services and programs that include treatment, prevention of illness, health promotion, and capacity building. We are an interdisciplinary team of health professionals, which includes family doctors, nurse practitioners, registered nurses, chiropodists, physiotherapists, occupational therapist, dietitians, social workers, therapists and community health workers. Our interdisciplinary team works to provide coordinated services and programs for all ages, with a focus on seniors, families with young children (in particular newcomers) and youth. The services and programs are delivered at the individual, group and community levels. To foster individual and community health by providing primary health care services that address the overall client needs in a coordinated manner to ensure proper continuity of care. To play a part in the on going implementation of universal health care by strategically focusing on accessibility to health services.